Thanks for stopping by and joining us again this week as we host another virtual refrigerator arts and crafts link up. This week we are sharing a fun art project that also incorporates some science! 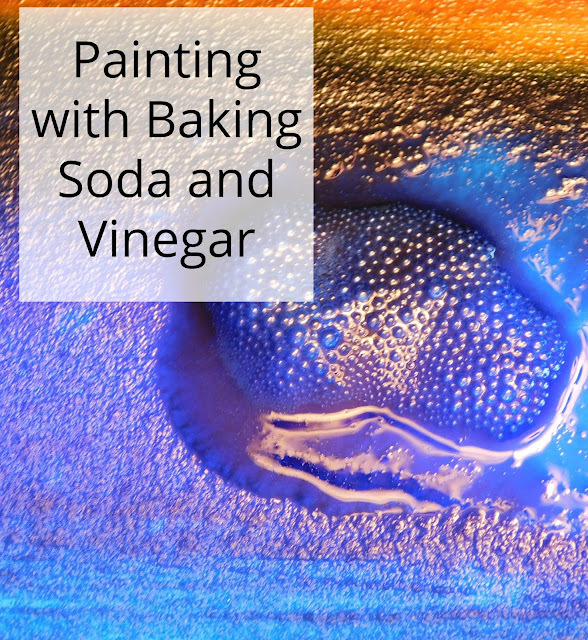 My boys are always fascinated by the reaction between baking soda and vinegar so when I saw a website that mixed baking soda and vinegar with paint I just knew we had to give it a try! First we mixed up small cups combining baking soda with our liquid watercolors (tempera paints would work too!). Then the boys painted like usual making sure to keep the paints stirred up. I prepared a small cup with white vinegar (lemon juice works too) and found a few small droppers. Then their paintings were finished they used the droppers to drip and quirt vinegar over their paintings. We could see where the baking soda bubbled in reaction to the vinegar. When we were finished adding the vinegar we set aside our papers to dry; it was fun watching how the volcanic action mixed and moved the paints around. The next day our paintings were dry and we could actually feel bits of baking soda and smooth spots where the vinegar had been. We all agreed they would be amazing as background papers either on cards or for another art project one day. The colors are so vibrant, how did I not know you could do this!! The liquid watercolors help make it so nice and vibrant! It really was a fun process and I warned the boys in the beginning that there was no way to control the reaction. Those are really cool!!! Another interesting project I think we'd like to try!